Need to de-clutter before Santa visits? - The Baby Diaries - A simple baby routine and milestone app that keeps track of baby's sleep, feed, change times, milestone achievements and photos all on your smartphone, iPad or iPod! Need to de-clutter before Santa visits? Last weekend I decided to de-clutter Alexander’s room. He’s 2, so you can imagine the range of toys in there. Everything from baby rattles, to puzzles, to large vehicles. I placed every toy, book, and unidentifiable item in the middle of his bedroom. It resembled the Eqyptian pyramids! I then sorted it. The room is now free of any broken toys, and things he’s outgrown have been handed down to his baby cousin Max, or given to charity. I confess that I am an amateur at this! So I turned to another mum – the amazing Sally at Neat Freak and asked for her advice. Here’s what she has to say. So Santa is on his way, and there is no way you can squeeze a paper clip in your kids rooms let alone MORE TOYS!! So here are some really easy and simple ways to make space and then let that space work for you. Pick a day and a time when the kids are not feral…did I say that?? I meant…when they are in a ‘good mood’ lol and get them involved! My son Matthew absolutely loves making the decision of what toys we donate – it gives kids a bit of control of a situation they may feel uncomfortable with – those toys were once prized possessions and letting them make the decision…or suggestively helping them make the decision…is a really positive way of teaching them that it is ok to part with things. Umm…you know…better than them finding Rex in the bin and cracking it lol!!! So now you have the kids involved and everyone is in the Xmas Spirit, pick up every single toy your kids own and make a decision. Or even better…dump it all in a big pile on the floor and go for it!! BROKEN? Bin it. OUT GROWN IT? Donate it. The best de-cluttering happens when you make fast decisions. What you have left is what you need to organise. There are so many ways you can organise your toys but I love ways that also save space and keep everything neat and in good condition so you don’t loose parts, or worse…a Barbie shoe! My favourite tip is zip lock bags! I absolutely LOVE them! They are inexpensive, and you can see what is in them. You can store whole puzzles, Lego, Barbies and Barbie clothes, Action Figure accessories and so much more. 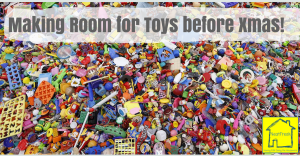 Take your home, and lifestyle into consideration, when thinking about where to store the toys and having toys organized means your kids play with them more, get bored less, and you save money!